Claire Prescott agrees to stand in for her sister at a Jane Austen seminar in England. She in an unemployed American and dissatisfied with her relationship with her boyfriend Neil. Once in England, she feels intimidated by the scholars and well-educated crowd at Oxford so she pretends to be a doctor. She meets a cast of interesting characters, one of which is Harriet Dalrymple, an older woman suffering from dementia and who has in her possession what she claims to be Jane Austen's original Pride and Prejudice manuscript. Things get more complicated when she meets handsome James, who also happens to be in the publishing business. The missing manuscript concept was really interesting and had me wondering where it would lead. Would it be kept a secret or would it be exposed to the world? The setting of Oxford, with a cast of characters that were fans of Jane Austen, a world totally foreign to Claire set the mood for the book. The romance on the other hand was unexciting. But the book is about so much more. It's about self-discovery, and learning to have balanced family relationships. Claire has always put her sister first in everything after their parents died, and it almost cost her the relationship with Neil. 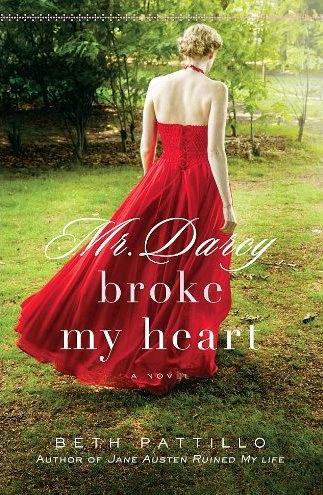 Mr. Darcy represents a fictional hero that women strive to look for and that causes them to miss the true picture of the real heroes in their lives. Claire needed a break to re-examine her entire life and her trip to England helped her to do that. She realized her need to reclaim her life and stop being so overprotective of her younger sister. I could understand her insecurities, her yearnings and her flaws but her attraction to James wasn't based on anything concrete. There was no tension between them and frankly, I wasn't crazy about James who appeared to be more of a stalker than a romantic hero. This was a fun, light book to read. Jane Austen fans will appreciate the references to her literary work. But if you're looking for a romantic read, this one might not be it. I liked this book, but didn't love it. I think we had similar thoughts on this one...the story about the manuscript was really interesting but the romance was just ho-hum. I'm not big on romance, so this might be for me. The idea of a lost manuscript is fascinating. Also the idea of being in a place that is out of one's element makes for a great setting. Too bad the romance didn't live up to it's end of the bargain. I'm not a huge romance fan but if it's introduced in the book I want it to really knock my socks off. Too bad this one disappoints. Pride and Prejudice is one of my favorite books. I am sooo in love with Mr. Darcy!